Now that we have set up our game world, we will add a Character (The Road Runner, well, not the Road Runner we are familiar with though.) to our game. Go to Assets->Import Package->Character Controller and import the Character to your project. Once imported just like the Skyboxes that we imported in the previous post, the Character will be available in the Standard Assets folder in the Project panel. Now you can see the 3rd Person Controller in the panel to the right of the Project panel. Drag that and drop it into the Hierarchy panel. Position this character to (0, 1.2, -7). It is time to configure this Character that we introduced to our game world. 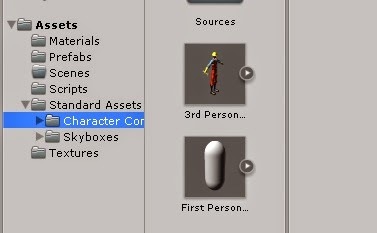 Click on the 3rd Person Controller in the Hierarchy panel and remove the two scripts at the bottom of this panel. Make sure you are left with Transform, Animation and Character Controller components on this character of ours. If you are wondering what a Character Controller component is, don't worry. The next few sentences should make it clear, I hope. Character Controller is basically a part, or perhaps component is the right word, of the Unity Physics. It is commonly used on up-right character models like the one we are dealing with. With Character Controller you don't need to add a Rigidbody for collision detection. Change the size of the Animations to 2. select run in Element 0 and jump_pose in Element 1 by clicking on the small circle with a dot inside. 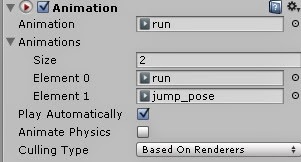 Make sure the Play Automatically is Checked and run is selected in the Animation field as in the image above. If we test this game by clicking on the play button, we can see that our runner is running, well at least he is acting like he is running, even though he is not moving forward. If I remove the scripts, cant move the character to the side. how did you do? Same here. Have you solved the problem? is it working for someone in unity 5 ? Anyone know how to get this working with unity 5? Use Third Person Controller with Animator component instead of Animation component. where is the character controller source file for download? and it is my first time for using it. but not what can I do? Where can i get the character? Your posts are always perfect.